The DAMA network is connecting students and teachers in dance and various disciplines of design and new media, from the Nordic and Baltic countries, in order to meet and do interdisciplinary practice-based artistic research together. Performing Archives is part of performance strand of Living Archives and a continuation of the AffeXity project. In Performing Archives, researchers and students worked together in a series of talks and workshops with the notion of cultural and personal archives. In addition, this was explored in conjunction with mobile augmented reality and social media applications as tools for content creation, prototyping and archiving. One outcome the workshop was short proto-p (proto-performance) experiments with mobile augmented reality. One was the DAMA Birthday Party which used Aurasma to embedd (and reveal) an emotional layer to individuals at a party. The playful element in this concept is that you are not aware of what emotional states that are assigned to you and but your friends will start treating you accordingly. This proved to lead to awkward situations, invoke imagination and create funny misunderstandings. Cloudbox: Searching for the perfect moment Another an proto-p experiment was the AR panorama for catching clouds. This was made with Argon augmented reality browser, displaying images of the sky in a skybox with six panels. For the group this came out of their existential reflections about what to archive and not to archive? If we really should and can capture the perfect moment? And would it be the right thing to catch something elusive as a cloud and domesticate it? On another note, creating a skybox with images if a sky had surprising kinesthetic qualities and choreographic potential. As you explore the cloudbox, you are invited to look up and hold the device to the sky, meditating the clouds. 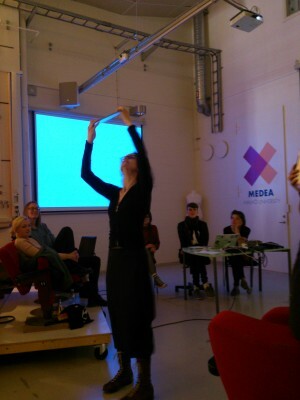 These gestures could be developed further in a dance and media art performance. Find out more about the process and workshops on the Performing Archives site and our Vine process feed. Tagged augmented reality, Aurasma, DAMA, Performing Affect, Performing Archives, performing memory.